MULTIHULL CENTRE Services has over 5 acres of boatyard storage on the Tamar Estuary with on site chandlery, crane and slipway hoists.We have a professional workforce with heated workshops but also encourage do it yourself maintenance by owners. The boatyard (est. 1968) also has pontoon berths and swinging mud moorings accessible from half tide. 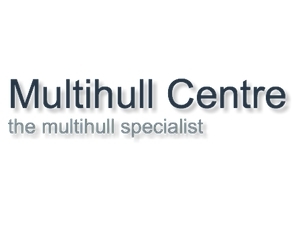 Multihull Centre Sales Ltd is a long established catamaran builder of both power and sail boats. Multihull Centre Sales Ltd offers designs from Patterson Twins range and Woods Designs and is agent for plans and kits from Australian Schionning Designs. Multihull Centre Sales Ltd has built special projects including an 11m wind turbine powered catamaran and a 40ft power sail monohull. Multihull Centre Brokerage is Britain’s most experienced and respected multihull yacht broker specialising in the sale of used Catamarans and Trimarans all over the world. Looking down on the Multihull Centre. We crane out from the quay in front of our office and slip boats on our slipway at the rear of the yard which is obscured by tree on the extreme right of the photo. If you look at the satellite view of the map above you can see the channel leading from the Hamoaze or lower reaches of the river Tamar to the Multihull Centre. Photo of Twins 36. We build cruising catamarans between 26ft and 43ft to Pat Patterson’s Twins designs and some of Richard Woods designs. We have also built to Schionning designs. We specialise in GRP Foam sandwich construction but have also built boats using Epoxy cedar strip and durakore/duflex.